Quilting Adventures: I'm still here......! It's been quite the week. My weekend was spent cleaning my home, including my sewing room. It's my way of mourning, clean everything! I do have a nice clean house, always a good thing! On the quilting front, I want to show you a quilt I made not only for my swap partner Sandy from OH, but also for myself. This is Crow meets Jack! The pattern is called Jack at the Gate by Jan Patek. It is machine pieced, machine appliqued using the Moda fabric line Blessings, designed by Brannock & Patek. 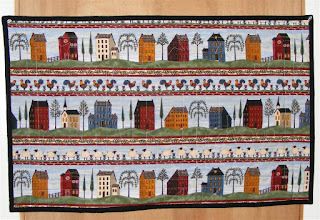 This is the fabric I used on the back of both quilts. It was a special gift that I received in June 2007 from Connie of Cootie Bug 2. Isn't it just perfect?!? I just love that fabric! Thank you again Connie for the sweet gift! I'm off to do a bit of hand applique. I'm working on a Jo Morton, Little Womens' Club piece. Have a great day and thank you for stopping by! Hi Carole...so sorry to read of your loss. Our pets are very special to us! I have to agree with you re Horror...I watched the Shining recently with DD...I was terrified! Sewing mojo was a bit quiet here too...we will get our "wiggle" back! My e-mail has not been 100%, so just in case, I thank you again the gorgeous bundle of fabric you sent me. It was such a great surprise! Thanks! Thanks for stopping by my blog and leaving such a nice compliment. I tend to go on a cleaning rampage too, when I am feeling overwhelmed. It does seem to help. Your 'Jack at the Gate' is a really sweet quilt and I love the backing fabric. Take care. I am so sorry to read about Midnight. I am sure he will be missed greatly. I do believe that cleaning is good therapy. I remember coming home from the hospital after my dad died and doing the same thing. I thought I must have been nuts. 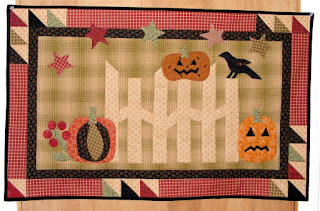 Love the cute Crow meets Jack quilt. Nice job and I am sure it was a welcomed swap. I'm so sorry that you lost Midnight. Cleaning is sure a productive way to mourn - I'm not so good! Don't overwork yourself and don't let the blog become a chore. Keep quilting though because Crow Meets Jack is adorable! Sounds like you are keeping busy in the quilting front...love the Crow meets Jack...very nice! What an awesome quilt. I love crows, here in Iceland they are called Hrafn (Krummi), they are a bit larger than your crow. I like the "When Crow Meets Jack" wall hanging - just right for the Fall season without all the other stuff that is around at that time. I am so sorry for the loss of your baby. Hope you are feeling as well as you can...love to share your work. I love your Jack at the gate! I"ve got that pattern and have been wanting to do it, seeing yours it makes me want to do it more.